We’d be lying if we said we haven’t enjoyed the last few albums from Chicago’s Nick Moss Band, with Lead Belly descendant Michael Ledbetter helping to bring some additional soulfulness to the band’s sound. But it was Moss’ earlier, more blues-focused recordings that initially caught our ear and that we’ve always tended to prefer, even as Moss and the band have — quite successfully — forayed into jam band, blues-rock and soul territory on more recent offerings. With Ledbetter having moved on to collaborate with guitarist Monster Mike Welch, Moss has made a few moves of his own, signing with Chicago’s Alligator Records label and adding blues harmonica player and vocalist Dennis Gruenling as a featured guest with the band, including on their Alligator debut The High Cost of Low Living, which we’re happy to report is a triumphant return to the more traditional Chicago and jump blues and old school rock stylings heard on Moss’ earliest recordings, with Moss pointing out in the album’s press materials that the deep blues “really is the music I love the most”. And there’s plenty of it to be found here, from the swaying Chicago blues of tracks like the opening “Crazy Mixed Up Baby” (which longtime fans may recognize from Moss’ 1998 First Offense album), here featuring some greasy horns and pulsing piano in addition to the gritty guitar and harmonica from Moss and Gruenling, respectively, and Moss’ burly vocals, and the shuffling “Tight Grip on Your Leash”, to the slow blues of “Note on the Door” on which Moss laments “baby, what have I done wrong?/ and I’m begging you, little girl: baby, please just come back home” and “He Walked with Giants”, a soulful, creeping tribute to late pianist Barrelhouse Chuck that namechecks such masters as Pinetop Perkins, Sunnyland Slim, Willie “Big Eyes” Smith, Willie Kent, and Little Brother Montgomery, among others, to jump blues and boogie numbers like the swinging “Get Right Before You Get Left” and a spunky cover of Otis Spann’s “Get Your Hands Out of My Pockets” that, along with the closing “Rambling on My Mind” (Elmore James), are probably as fine of examples of the band’s cohesiveness as any, to the fun, catchy instrumental “All Night Diner” (Santo & Johnny), one of two tracks on which keyboardist Jim Pugh (Robert Cray Band, Etta James) plays, on organ for this one and on piano for the Spanish-flavored Gruenling-penned and -sung “Lesson to Learn”, for which the band is also joined by co-producer Kid Andersen on rhythm guitar and shakers. The grooving title track features tough vocals from Moss to match its stinging, Elmore James-like slide guitar, while “No Sense” may be the sweetest insult song you’ve heard, starting on a Jimmy Reed “Honest I Do” sound before Moss dishes out such clever lyrics as “I would ask you to leave me darlin’, but you couldn’t even find the door” and Andersen provides a guitar solo of his own. There’s also the Buddy Guy-style playing of “A Pledge to You” that we imagine might’ve been one that Ledbetter sang if he were still present but that Moss handles quite well himself, with Gruenling — who cites “the live interaction and reaction” as what he loves about playing with the band — taking a second turn on vocals for the peppy, early rock/jump blues of “Count on Me”. 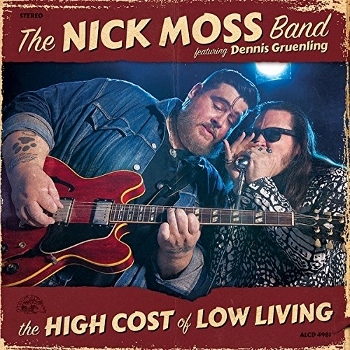 While Moss and his three bandmates (pianist Taylor Streiff, bassist Nick Fane, and drummer Patrick Seals) could easily have pulled this album off themselves, Gruenling’s playing adds another nice dimension and helps raise the project to an even higher level, making The High Cost of Low Living one that’s worth picking up at any price! This entry was posted in Albums and tagged Dennis Gruenling, Jim Pugh, Kid Andersen, Nick Moss Band. Bookmark the permalink.